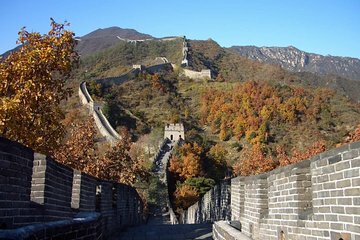 Disfrute de atención personalizada y un itinerario flexible en este recorrido privado de 5 horas caminando por la sección de Mutianyu de la Gran Muralla. Se incluye el teleférico, el telesilla y el tobogán, así como el traslado de ida y vuelta en transporte privado desde su hotel en Pekín. Elija entre una salida por la mañana o por la tarde para adaptarse mejor a su horario. Esté preparado para la recogida a la hora de salida elegida (mañana o tarde) en su hotel en Pekín. Lleve ropa cómoda y calzado adecuado para caminar. Reúnase con el guía experto, suba a bordo del vehículo privado para la excursión, y póngase cómodo para disfrutar del paisaje en el trayecto de hora y media hasta la sección de Mutianyu de la Gran Muralla. Puede optar por subir a pie hasta la parte de arriba de una de las 23 torres, coger un telesilla o un teleférico. Por el camino, puede optar por caminar o coger un tobogán. El guía le ayudará a elegir la mejor forma de ir en función de la temporada y las condiciones. Pase unas 2 horas por la muralla y alrededores, y después, regrese a Pekín para el traslado de vuelta a su hotel o a cualquier otro lugar de la ciudad que desee. This trip to great Wall I will always remember. Out guide was great in giving us all the information about the wall and places to take great pictures. The cable car is the best way to go and come back on the tour of the wall. We went early and beat the long lines for the cable car. I highly recommend this tour. This was such a wonderful experience! Our tour guide and driver picked us up from our hotel, on time in a wonderful car. Our tour guide was very knowledgeable, and spoke English, well. When we got to the Great Wall we bypassed the lines and drove straight in so awesome. This side of the Great Wall was so beautiful, so green, and the toboggan ride down the side of the wall was a really fun way to end the experience. This was a wonderful day. We had a delightful ride through countryside to the wall. Our guide was lovely. She spoke very good English and was informative, lively and personable. We had concerns about being able to enjoy the wall since we are older and have some mobility challenges. This tour enabled us to enjoy the wall without difficulty. It was wonderful to be able to use the cable car. We highly recommend this tour. Angela showed us a wonderful time at the Great Wall. She picked up my husband an I at the Hotel Eclat and off we went. Mr. Yung was a very good driver. The day was clear and drive was easy because it was Sunday. We chose the 8 am tour which was smart because there were hoards of tourists when we were leaving the area about 11:30 am. We walked to 4 beacons which was a good amount. Angela took very memorable pictures of us with the Great Wall as the backdrop. We sent the pictures to family and friends around the world. The toboggan ride down the mountain was really fun and safe. It was easy to handle. Again, lots of great pics. Angela taught us so much in the car before we arrived, we could just go right up the chair lift. I recommend this trip to someone who likes to see a beautiful part of the wall and spend only half day. This tour was AMAZING!!!! I would highly recommend it. Our family of 4 loved it 2 adults, 2 children - 14yrs and 11yrs. David was the best tour guide and very knowledgable. The Mutianyu section is beautiful. We rode the Cable car up the mountain and Tobogganed back down.